Hey there! I'm going to try to do multiple patriotic nails over this next week! Today I have for you some I did a while back but saved for this week! I sadly didn't take many pics so this post will be a bit short. For this I tried to capture a cute couple watching fireworks. In my head it's based in Jacksonville Florida but really it can be anywhere you want! :) my favorite thing to do on the Fourth of July is to go downtown and watch the fireworks! Jacksonville has the BEST fireworks! For this look I used Zoyas Sailor and the rest was done with acrylic paint!! All free handed with a small brush. I was really nervous about the people not showing on the dark blue but thankfully when I put the top coat on it all "came to life" :). I really like these! 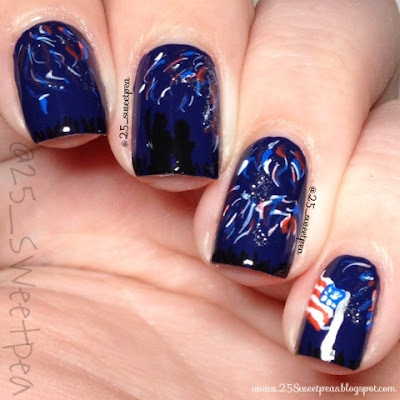 They are probably my favorite Fourth of July nails!what do you all think? my favorite thing to do on the Fourth of July is to go downtown and watch the fireworks! Jacksonville has the BEST fireworks!